For a general map of Peloponisos, click here!(40K). 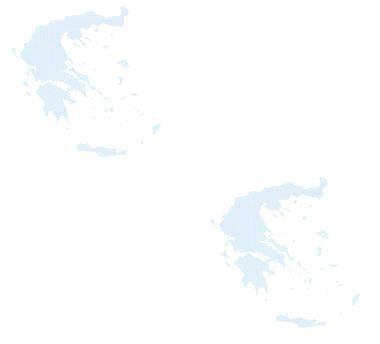 For a map of the Messinia area, click on map above. A historic town where on May 12 and 13 1821, a major battle was won. Every year, the battle is re-enacted for the benefit of the visitors. The main town in the area and site of a major electricity generation station. Ruins of an ancient theater are in evidence nearby. A town built on an ancient site, the place where the Temple of Despina was situated. A very important village, situated at an altitude of 965 meters (about 3300 feet). Near this village are found ruins of the temple of Dia (Zeus) and Pana. In ancient times, the mountain was regarded as sacred. The most weird church in Ellada is found here because it has 17 enormous holly and maple trees growing on its roof. Most of them are taller than 30 meters! The capital of Messinia, built on reclaimed swamp land with a very beautiful castle on top of the nearby mountain. Kalamata is graced with an airport and is served with many buses from Athens, as well as a narrow gauge railway built by Italians. A village built on the side of the Taygetos mountain with three very beautiful Byzantine churches, all of them endowed with frescos. 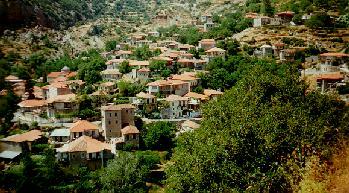 A village situated halfway up the mountain Taygetos, relatively near to Sparta. Nearby this village is the gorge where Spartans used to throw their sick or invalid children. The Spartans were people that believed a person physical condition is paramount. If a child was not born with perfect health it was thrown down this gorge. This is the name for the valley that the road follows west of Sparta on the way to Kalamata over the Taygetos mountain(Megali Lagkada = Big Valley). 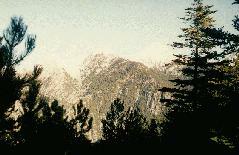 The valley is full of plane trees and in one place, crosses the tree line as it rises above 1000 meters. There is a lovely taverna and motel on the highest point of this road. A lovely mountain village, built between a spruce forest and the Monastery of Taxiarhon, which used to be Catholic, and not Orthodox. Another beautiful mountain village, relatively near to Kalamata. It is the site of a monastery of Agios Antonios, and nearby is also situated the Monastery Vardakiou, dating back to the 17 century which was used as a hiding place during the war of Independence. Named after a wall that was built by the Mani people (Maniates) to stop the entrance of Ibrahim in 1826. This was the last try by the Ottoman Turks to invade Mani. They subsequently gave up. A lovely pebble beach, about 15 km (10 miles) south of Kalamata. This castle was built by the Ottoman Turks in the 17th century on the ruins of an ancient acropolis in a town called 'Gerinia.' Together with some other castles, they played an important role in Mani's history and in the latter part of the 17th century, passed to the hands of the Maniates. A wonderful seaside town, near the Virou gorge with a very lovely sandy beach. A castle used to be situated on the nearby hill, dating back to the 12th century, ruins of which are in evidence. Nearby is also one of the oldest churches in Greece, that of Agios Spiridon dating back to the 6th century. A very nice village up on the Taygetos mountain and the starting point for a visit to the Virou gorge. 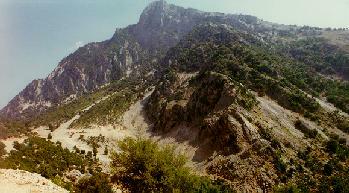 Mountain roads (4WD only) lead up to the Taygetos mountain, passing the snow line at about 1700 meters. There is plenty of wildlife to see as well as wonderful flora. Mountain tracks lead to many directions, including relatively near to the peak, Profitis Elias at 2407 meters (7500 feet). A very nice village on the side of Taygetos, situated at an altitude of 590 meters, with superb springs, an unexplored cave and a very lovely church dedicated to Agios Apostolos. 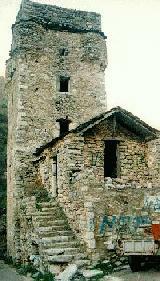 A Mani tower is in evidence right on the main square. A lovely seaside town with many tavernas (fresh fish served daily in the summer). With warm shallow waters, it is rather busy with tourists and locals alike. A very nice village, situated on the side of bay up a very steep hill with the road going all the way down (a 250 meter straight descent and ascent) to the sea and re-ascending on the other side of the bay. In contrast with other Mani villages which are very barren, Itilo is adorned with many trees. A nice, small seaside port with a sandy beach and a couple of great tavernas. It is situated very near Itilo, as the roads descends to sea level. Great fresh fish served here, and excellent swimming to be had. The second largest town in Messinia, also called 'Nisi' (island) by the locals because the river Pamisos used to encircle it. It is named after ancient Messini which is 20 km away (about 14 miles). A very beutiful town with a nice beach and clear waters. Frequented by the Kalamatans during the summer. A very pretty town, facing Mani on the Messinian peninsula. It is built on a promontory culminating in a castle. With its whitewashed houses, its narrow streets and amazing views from the altitude, it is a sight well worth going out of one's way to see. The town is founded on 'Asini,' a town of prehistoric times, originally built by the people of 'Argous.' Later taken by the Venetians, who also built the castle, and by the Turks who had it from 1715 until 1828 whern it was liberated by the French General Maison. A nice seaside village nakmed after an ancient port which according to popular belief was in the place of today's village frequented by many locals who know a good thing when they see one. A notable town in the South western part of the Peloponese, with a very nice beach and an impossing castle. 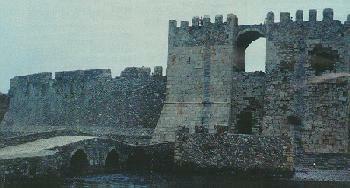 Homer made many references to Methoni who reached its peak when the Venetians took it over in 1209. They built the castle and made it a major shipping and commercial port. After three centuries, the Turks took it in 1715 only to be liberated in the famous battle of Navarino by the French General Maison. The castle is one of the biggest in Greece and is connected to Mourtzi island with a narrow bridge. The Turks built an octagonal tower on this island to protect the castle. The famous port situated on the south part of the Navarino bay. The bay, in the shape of a horseshoe, is bounded on the western side by the island of Sfaktiria. On the north side of the bay is the ancient Pylos, now called Pila. Around the 3rd century, the Francs built a castle on the bay between the modern Pylos and the ancient Pyla which is now called Paliokastro. When the Turks conquered the town, they built another castle, a neocastle, above the modern Pylos called Niokastro. In 1821 the Greeks took it only to be re-taken by Ibrahim Pasha in 1825. In 1827, exactly on October 20, the famous battle of Navarino took place when the combined naval forces of England, France and Russia overwhelmed the Turkish and Egyptian forces, thus ending the occupation of Greece by the Ottoman Turks. Many tombs are in evidence including some in the Sfaktiria honoring the Russian soldiers who died during the battle. 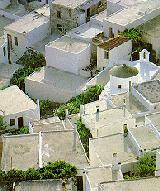 A very nice village, near the site of Nestor's cave, about 10 km (6 miles) north of Navrino bay. Many wonderful walks in the pristine forests, beautiful cliff-side monasteries and marvelous views crown the area. Added to this are villages like Perdousa and you have a winning visit designed to escape the summer heat (1100 meters altitude). A village where the battle of Papaflessas and Ibrahim Pasha took place. Papaflessas, incredibly outnumbered by the mighty Ibrahim, stood his ground only to die together with all his troops. His courage became an example for the rest of the Greek troops, who finally drove the occupying army away. A small village made famous after the ruins of Nestor's palace were found here. Dating back to the 13 century BC, they were built at the same time as Mykinae. A lovely village with a Museum dedicated to many of the finds from Nestor's palace (see above). Situated within a fertile valley adorned with cedar and plane trees. A nice town, that suffered greatly in the earthquake of 1886. Very few of the original houses remain. 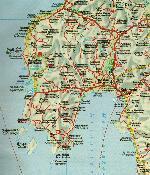 The nearest seaside village is Limenari, with tavernas and restaurants. A nice seaside town split in two with the Pano poli (above town) full of traditional houses, cobblestone paths and the castle, and the newer Kato poli. A lovely village, relatively near to Kalamata with a frankish castle built upon the foundations of another, older, byzantine city. On the north side, is the Samarina monastery, having one of the prettiest Messinian churches. One of the most impressive byzantine monasteries of the whole Messinian peninsula. Named after the Monk called 'Androniko' who built it and subsequently restored it. The main church has lovely wall frescos and catacombs. A small village very near the ruins of the ancient Messini. Also found nearby is the Monastery dedicated to Saint Voulkano. The actual village has abundant springs and a museum with relics dating back to the ancient sites. Ancient Messini ruins include a theater, the temple of Artemis and the Asklipio. Also found are ruins of an impressive wall that encircled the ancient city, interrupted by stone towers. Ancient Messini was built by Epaminondas between 375 and 365 BC. A holy mountain in the middle of Messinia, crowned by the Acropolis and the temple dedicated to the god Zeus. Here sacrifices were performed, of both animals and humans. Today, upon the ruins, is the Monastery of Voulkano, built around the 16th century. Access is provided through keys procured at the New Moni Voulkano, found a little lower on the side of the hill. A lovely small village, full of Mani-looking tower houses. Here is the intersection of the Kalamata-Megalopolis and Pyrgos-Kyparissia roads.